We have a detailed delivery and installation guide available as well as specification sheets. Below is some summary information to help you get prepared. Please contact us for a specification sheet which provides all measurements needed for installation room by room, as well as all heat outputs. Our cast iron radiators are built and factory pressure tested to 6 bar with air under water (please refer to the maximum final operating pressures on the product data sheets). Paladin provides an installation guide with every order to ensure your radiator is handled correctly during installation. 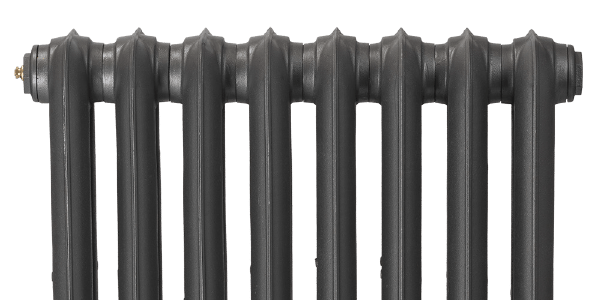 The maximum length a radiator can be delivered in is 1200mm, radiators over this length it will be provided in two or more blocks for re-assembly (by others), full instructions are provided. We use the national pallet delivery network for delivery; this means the delivery will be made to the nearest lorry accessible hard standing. Once the drop off is made it is up to others to move the radiators in to the property. When the radiators are on a pallet, its full weight and length are supported. Once off the pallet the radiator needs to be carried upright at all times. Please ensure you have sufficient help to unload your radiator when it is delivered to you. Remember cast iron radiators are very heavy and it is important to follow all H & S safe practice guidelines at all times. Our radiators are fitted with ½” BBOE (bottom, bottom opposite ends) connections as standard and complete with a blanking plug and brass air vent. An option of ¾” bushes is also available and you can request the fittings to be re positioned to suit particular installation requirements if necessary. All our radiators come with a comprehensive ten-year guarantee but be sure to follow all current installation regulations and in particular the system should be cleaned, flushed and dosed with a suitable high quality inhibitor in accordance with BS7593.